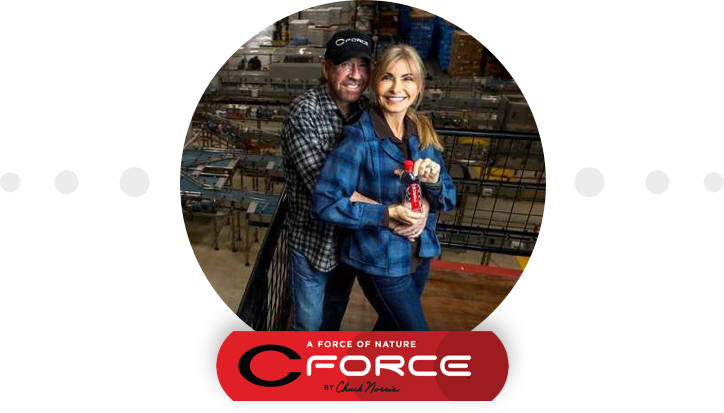 CForce Bottling Co. is a certified woman-owned business founded in 2015 by Gena and Chuck Norris. CForce is a full-service bottling facility that offers private labeling, bulk water, raw bottles sales, co-packing and branded products. Located in Navasota, Texas on the Norris family ranch, CForce is unlike any other bottling company. As a family-run business with local roots, we take care of our CForce family while striving to provide customers with a superior product. The Lone Wolf Aquifer was discovered on the Norris family ranch during the search for a new well—what was found instead was a sustainable source of naturally pristine water that dates back to the last ice age. It is bottled at the source on the Norris family ranch where it is naturally filtered through volcanic rock and then deposited into a deep, sustainable aquifer. The water emerges naturally pure, rich in minerals and void of any biological factors. The aquifer cultivates clear, clean water with a naturally high pH and smooth taste. We take pride in the purity of CForce water and eco-friendliness of its packaging. But it doesn’t stop there––CForce is also a force of good. A portion of CForce proceeds benefits Kickstart Kids, a program that supports at-risk youth by teaching character through karate and a cause the Norris family has supported for over 25 years.